Details about Black Orchid Eye Chilli - A Rare, Stunning Medium Hot Beautiful Chilli Variety!! 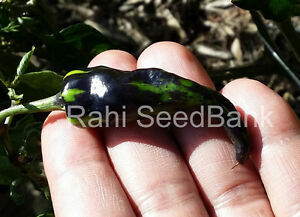 Black Orchid Eye Chilli - A Rare, Stunning Medium Hot Beautiful Chilli Variety!! Import duties, taxes, and charges are not included in the item price or shipping cost. These charges are the buyer's responsibility. Please check with your country's customs office to determine what these additional costs will be prior to bidding or buying. Please check with your country's quarantine controls if these seeds are allowed to import. Seller is not responsible for that.